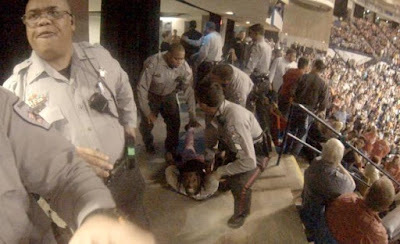 Five sheriff's deputies in North Carolina have been suspended without pay following a Donald Trump rally where an African American protester was sucker-punched as he was being escorted out, the Cumberland County Sheriff said Wednesday. The March 9 rally in Fayetteville, N.C., was caught on videos that showed a Trump supporter assaulting an anti-Trump protester, who was then detained by numerous uniformed men. "The actions of the deputies and their failures to act in situations such as that which occurred during the Trump rally at the Crown Coliseum have never been and will not ever be tolerated under the policies of this office," Sheriff Earl Butler said in a statement.